Major HTC One M9 Benchmarks Posting Turns Out To Be Disappointing - No Snapdragon 810 On Board? Major HTC One M9 Benchmarks Posting Turns Out To Be Disappointing – No Snapdragon 810 On Board? With things getting interesting before the upcoming flagship launches at the Mobile World Congress due to be held in Barcelona Spain, we have more benchmarks for you today from one of the upcoming devices. While the Samsung Galaxy S6 has been the star of benchmark leaks over the past couple of days, looks like the HTC One M9 has decided to break radio silence on benchmarks with a leak of its own today albeit with a disappointment. Today’s benchmark, posted on the site CompuBench features an HTC device with the codename OPK71. While there’s no certainty in stating that the device is the One M9 but the codename does bear resemblance to the symbols speculated to belong to the One M9. Specifications for the device are also quite similar to what’s being rumored so far. The benchmark lists the device with a 5.1 inch screen touting a display resolution of 1440 x 2560. 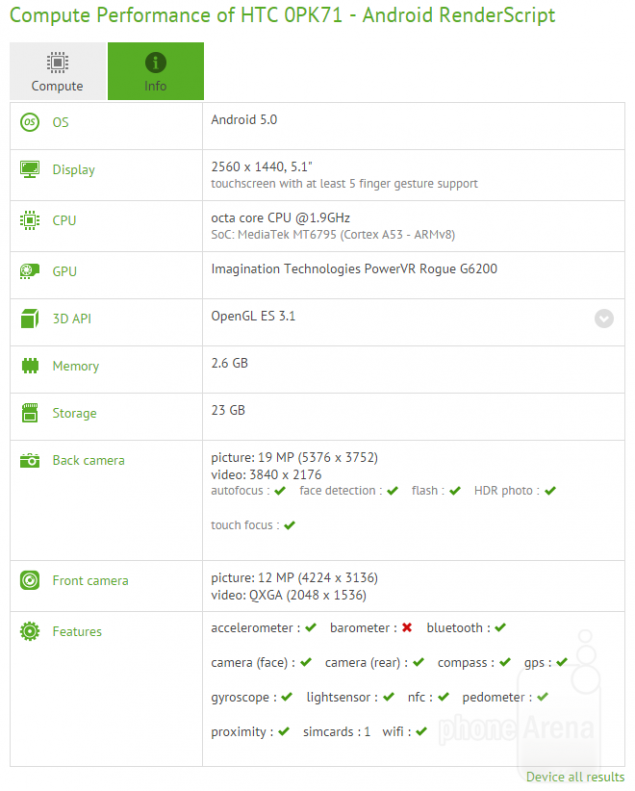 RAM for the alleged HTC One M9 prototype is listed as 3 GB and the camera resolution is 19 MP – as opposed to the 20.7 MP Sony sensor the HTC flagship is speculated to come with. The disappointing bit of news today’s benchmark carry is the presence of a MediaTek processor on the device. IF the device listed above is indeed the HTC One M9 then the MediaTek MT6795 won’t end up doing the device any justice if it is to compete with the top smartphone flagships out there. Coming with eight ARM A53 cores, the processor does pack a performance punch, but it isn’t heavy enough by far to power a top tier flagship device. So all we can do is hope that the device above is a prototype intended to test features apart from the performance on the HTC One M9. Or maybe its the company’s way of adding more speculation around its upcoming device. All will become clear in less than two weeks. Stay tuned.